Saguaro Books, LLC and Aquitaine, LTD will have a table at the American Association of School Librarians • 18th National Conference and Exhibition, November 9-11, 2017 at the Convention Center in Phoenix, AZ. Hope you will visit us. Giveaway ends in 3 days. The primitive-looking coelacanth (pronounced SEEL-uh-kanth) was thought to have gone extinct with the dinosaurs 65 million years ago. But its discovery in 1938 by a South African museum curator on a local fishing trawler fascinated the world and ignited a debate about how this bizarre lobe-finned fish fits into the evolution of land animals. There are only two known species of coelacanths: one that lives near the Comoros Islands off the east coast of Africa, and one found in the waters off Sulawesi, Indonesia. 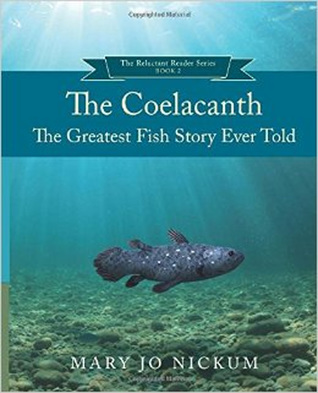 Many scientists believe that the unique characteristics of the coelacanth represent an early step in the evolution of fish to terrestrial four-legged animals like amphibians.